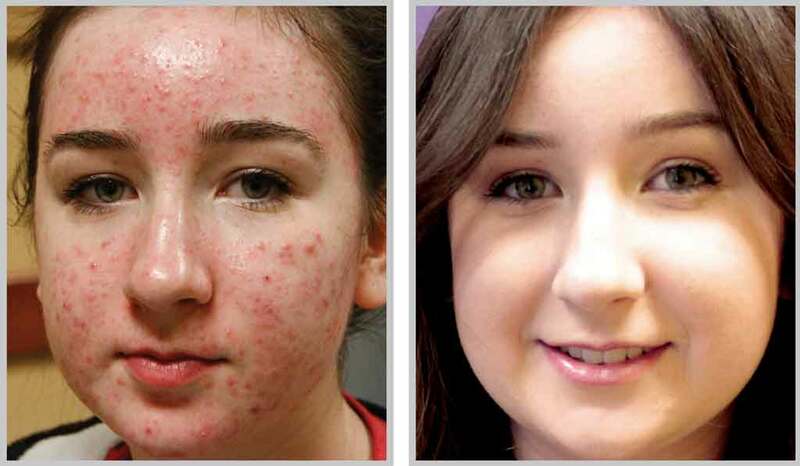 With the combined medical experience of Dr. Tamra Schue-Garberg and Rick Schue, Altaire Clinic offers medical acne therapy treatments in Fargo, ND. Have you tried numerous methods to get acne under control? Now, drugs and other over the counter “remedies” can be a thing of the past. Why deal with the wait and potential side effects of those options when you can have clearer skin in typically just a few short acne treatments. Forever Clear BBL™ laser therapy brings you hope if you’re struggling to control active acne or suffering from the effects of acne scarring on your face or body. Acne affects an estimated 25% of all adults and nearly 50% of all adult women due to hormonal changes occurring as a result of pregnancy, added life stress and the fluctuating hormone balances characteristic of pre-menopause. BBL laser resurfacing and remodeling helps generate new collagen, plumping your skin in scarred and pitted areas and smoothing your skin’s imperfections. Forever Clear BBL is a cutting-edge acne treatment that uses the power of light to comfortably and effectively clear acne without creams or medicine. BBL is the world’s most powerful IPL (Intense Pulsed Light) device delivering light energy deep into your skin to stimulate and regenerate your skin cells, This leaves you with clear, healthy, and radiant skin. Please keep in mind that each patient is unique and your results may vary. Skin is first treated with BLUE BBL light to eliminate acne-causing bacteria at its source deep down in the pores. For added benefit, the skin is then treated with SkinTyte II™. It uses INFRA-RED light in rapid, gentle pulses to initiate the body’s natural healing process. Altaire Clinic is able to customize your treatment plan with skin care regimens and prescriptive medications, if needed, for long lasting results. Will Altaire Take Care of My Prescriptions? Yes, the providers at Altaire Clinic are able to prescribe medications. Certain medications may be recommended to achieve results quicker. Do I Need to Stop My Medication to Have This Done? No, please bring a list of the medications you are on so that we can make sure your treatment plan is optimized. I Want My Skin to Look Good For a Special Event, When Should I Start Acne Treatments? The sooner the better. Ideally, we want to start your laser treatments at least 3 months before a special event. Forever Clear is generally an effective comfortable, fast, and safe treatment. Most areas of your body can be treated. The most common treatment areas where acne is found is on the face, neck, and back. How Long Does The BBL Treatment Take? Is The BBL Treatment Uncomfortable? The procedure is non-invasive and typically gentle and safe. Generally, there is no need for a topical anesthetic, however, your provider may choose to use it depending on your needs. You may experience some redness that should resolve within a few hours. Consult your provider if it does not. Your treated skin will look clearer and pores will be less noticeable. Your provider will help you with more information on what to expect as well as give you an aftercare plan to follow that will involve avoiding direct sun exposure and using sunscreen. There is typically no downtime. Most patients can wear make-up and resume normal activities immediately. Please follow your provider’s aftercare plan until skin is completely healed – typically about one week after the treatment.